The Holden Commodore a cracking family car but a bit too beeeeeepy!!! The new Holden ZB Commodore is the first one to be made in Germany rather than Australia and I really like it! Apart from all its beeping, moaning baby-waking alarms it is a very practical BabyDrive! Storage in the boot is fantastic! When it is empty the boot holds 16 shopping bags!! This is equal to the VW Passat and more than the Skoda Superb, Octavia and VW Arteon! I could fit the Mountain Buggy Duet twin stroller in with six shopping bags, and the Britax Flexx single or tandem stroller fitted in easily, both lengthways and widthways with 10 and eight shopping bags around them respectively. You could transport a large dog in the boot of the Commodore and have room for a few shopping bags or a basic compact stroller too, so it's a great practical space. Inside the cabin, storage is pretty good too. The two cup holders in the central console are well sized for reusable and disposable coffee cups and a large refillable water bottle fits nicely in the front door bins with my wallet. The glovebox is small but did hold my wallet and iPad, the central console storage box has a wireless charging phone storage slot inside along with a USB port, and there's a glasses case in the ceiling. In the back, there were two well-sized cup holders in the central seat backrest and map pockets in the back of both front seats. The door bins in the back are smaller than the front but will hold a 600ml bottle. The Holden Commodore has top tethers in the back of all three rear seats that I found I couldn't access easily through the boot as it was so long! It was easier to bring the seat backs forward to connect them. They are clearly labelled and easy to connect to. 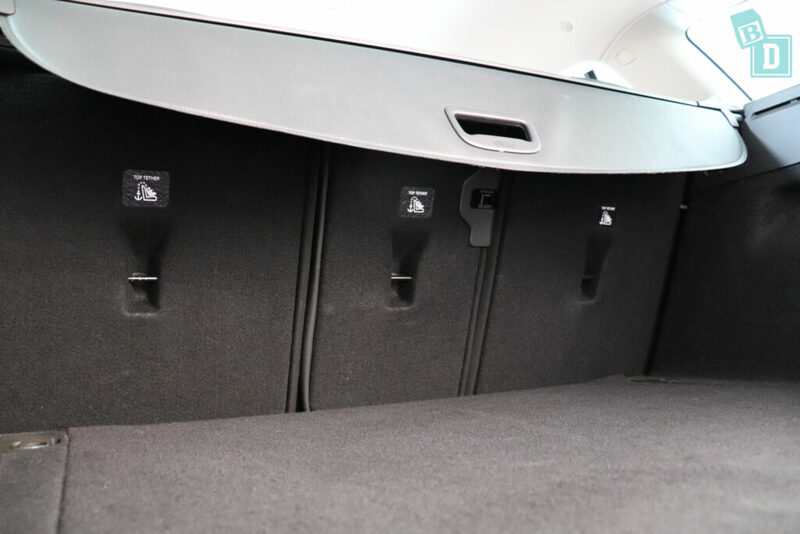 There is ISOFix in the two outer rear seats, within plastic guides and easy to connect to. I found I could only install two child seats (the forward-facing Britax Platinum Pro and rear-facing Britax Graphene) in the back of the Commodore because the rear seats are so sculpted and the Commodore roof narrows so much at the top, which reduces the shoulder or headroom so much that with three child seats across they'd stick out from the sides of the car and you couldn't shut the doors! The Commodore was a great car to drive, I really enjoyed it! Around town especially it just felt really smooth and responsive! I did notice when the engine was cold it would make some strange noises and rev quite loudly and when I stopped at a pedestrian crossing I did make some people jump when I pulled away as the engine growled into life, which to be honest was a bit embarrassing!!! The media system was easy to navigate, simple to use and includes Apple CarPlay and Android Auto which was great too. The sat-nav was also good and easily muted with one touch on the screen. The biggest downside for me was the beeeeeping and warning alarms in the Commodore!! I think it is a Holden thing as I remember a similar feeling with the Holden Equinox driving me mad with never knowing what or why it would beep next!! This was very un-BabyDrive friendly as when Bub is asleep I was just worried an alarm would go off and wake her up!! The Holden Commodore scored a five-star ANCAP safety rating in 2017 and has six airbags as standard. How much can you get in the boot of a Holden Commodore? From empty I could get 16 shopping bags into the boot, that is a pretty impressive amount and one more than the Skoda Superb, Octavia and VW Arteon which all had very large boots! The VW Passat had a nice big boot and held 16 shopping bags too. With the Mountain Buggy Duet twin stroller in the boot, I could get six shopping bags in with it. The Britax Flexx tandem stroller fitted widthways and lengthways in the boot, which gives great flexibility, along with eight shopping bags around it. The Britax Flexx single stroller fitted with 10 shopping bags around it. The Britax compact Holiday stroller fitted with 13 shopping bags in the boot. Or you could put a very large dog in the back there too! The boot of the Commodore was a nice flat, carpeted area which was great for an emergency nappy change. Inside the cabin the storage is good. There are two cup holders in the central console that are a good size for a disposable or reusable coffee cup, but you can't put a bottle in them because the dashboard overhangs them. There is a large lidded well behind the gear lever as well as the central console storage box with a lid that doubles as your armrest. The central console storage box is not rubber lined but it is a really good size, has a position for your phone to charge wirelessly or using the USB beside it. There is a glasses case in the ceiling which has a padded lining on part of it but I found my glasses moved around in it so my lenses got scratched on the plastic. There are lit vanity mirrors in the front in both visors. The glove box is nicely lined, it is however quite small and I could only get my wallet in there with the manual. I couldn't get the iPad in there as it was too narrow. The door bins in the front are a really good size, they would hold a large refillable water bottle and my wallet and a 600ml bottle fitted in there with them too. In the back, the door bins are smaller and will only hold a 600ml or baby bottle. There are map pockets in both front seat back but they are portrait rather than landscape in proportion, which is unusual. They would hold an iPad but not conceal it. There are two cup holders in a fold-down armrest in the central seat back. They would hold a large refillable water bottle or a reusable or disposable coffee cup. How noisy is the new Holden Commodore? The volume of the parking sensors cannot be turned down in the Commodore but you can disable them with a button on the central console in front of the gear lever. I could not find a way to just mute the sensor noise and keep the visuals. In front of the gear lever, you can also turn on and off the auto engine cut out and the lane departure warning. A lot of these noises come with the increase in technology and especially linked to safety features and alerts. For me, these all have their place. Another thing I have realised is I spend my time in a lot more places where small children roam, parks, beaches, play gyms, swimming lessons, daycare centre etc. I have become more aware that when I’m reversing or maneuvering in the car parks I have to triple check for small children running around behind me or being in my blind spot when reversing. For this I LOVE reversing cameras, I just don’t like their beeping sounds!! The indicators are nice and quiet, so wouldn't disturb a sleeping passenger. The sat-nav voice can be quite easily muted, by pressing the volume logo, on the map screen. The media system is really nice to use in the Commodore, it is really simple and although quite basic it is logical, which is great! It has Apple CarPlay and Android Auto too which is fantastic! I also found it was really easy to connect my phone to the Commodore's media system too. The audio settings are remembered, so if you have muted the music before getting out of the car on one journey it will be muted when you get in for your next journey. Road noise is good in the Commodore, but the engine noise is loud, especially when the engine is cold. It is as if Holden have designed it to have the loud noise to sound like the previous V8 models that were made in Australia! There is a display in the dashboard that lights up to let you know when a seatbelt has been removed, as well as the alarm sounding. The doors of the Commodore are really noisy, an alarm seems to beep to alert me to everything including when I come to a complete stop and open the door!! This time warning me that the key is still in the vehicle… of course it is as I haven't got out yet!! But you have now woken my baby so thanks, Holden!! When you lock the car using the fob it makes that awful beeping noise to confirm it is locked, which would kindly wake your baby if you were transferring them from the car to their cot! I really dislike the locking beep, I have a neighbour that has a Commodore and they come and go at all times of the night and I wake every time I hear their car beeping, it is completely unnecessary! The Commodore doors slam shut loudly and the door bins are not lined so anything in them really rattles. The windows, however, actually open and close really smoothly and quietly which is lovely in contrast! How many child seats can I fit in the Holden Commodore? The Holden Commodore is a five-seater. 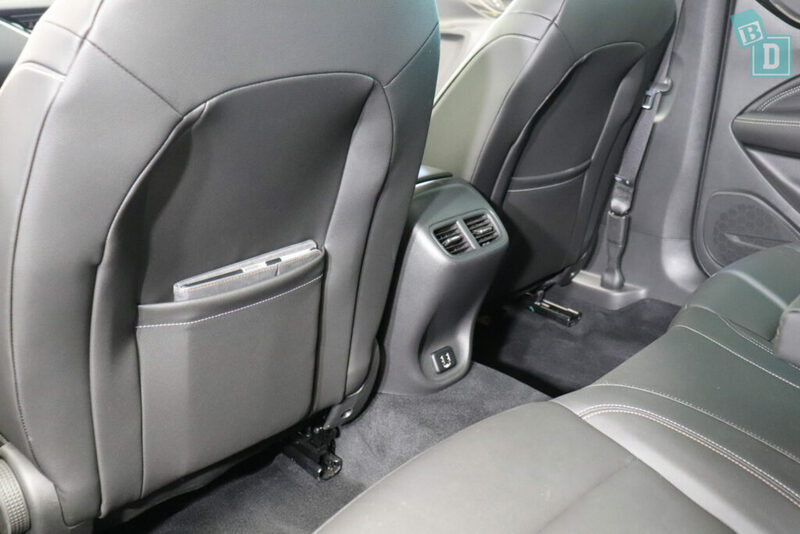 There are ISOFix points in each of the outer rear seats that are within plastic guides so they were nice and easy to connect to. There are top tethers for all three rear seats. They are in the top of the seatbacks and I found I had to access them through the top of the seat backs rather than through the boot as the boot was so deep. 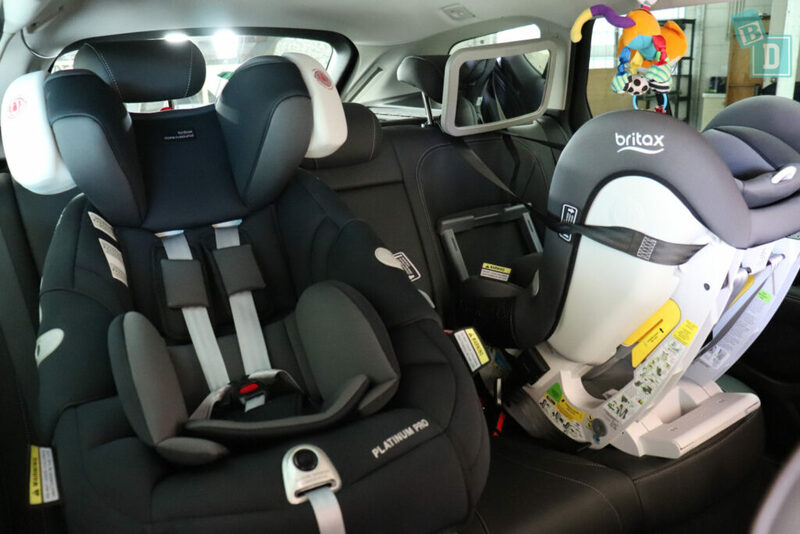 I found I could only install two child seats in the back of the Commodore, and I used the Britax Platinum Pro (forward facing) and the Britax Graphene (rear facing). The two child seats were nice and simple to install, but the seat bases and seat backs are quite shaped and sculpted which is why I found I couldn't move the child seats out far enough on the rear seat base to fit three across the row. The central seat base is quite humped as well which made it difficult too. The sides of the roof of the Commodore slope inwards quite far and I realised when I tried to install three child seats that the car wasn't wide enough at the top. Even with two child seats installed, in the outer seats, you need to watch that the doors will fully close without impacting the sides of the child seat. Posting bub into her child seat from outside the car I found there wasn't really the headroom to poke my head in to do up the child restraint and I found I hit my head on many occasions because the roof is slanted and low at the sides. From inside the car, with only one child seat installed, there is more room to post bub into their child seat as the roof is domed so you have more space. There is room to feed bub in the back with only one child seat installed too. The seats are leather with no perforations and minimal stitching and seams which make them perfect for a BabyDrive as they would be easy to clean. The front seats of the Commodore Calais Tourer I tested are really great and comfortable, the drivers are electric adjustments at the sides and the passenger seat is manually adjusted. They are both very comfortable. 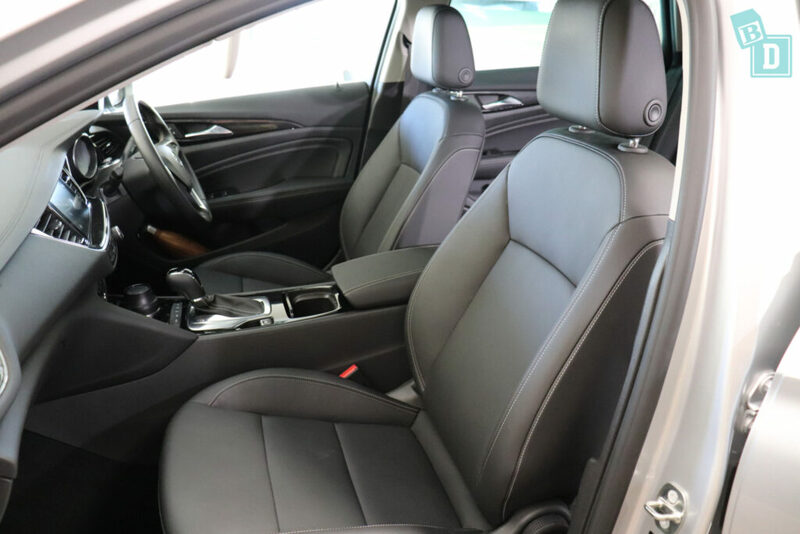 In the back, the outside seats are comfy but the central one has a very hard backrest because of the fold-down armrest and the hump in the central seat base is uncomfortable and the hump in the footwell is so big you have to straddle it rather than putting your feet on it. For mum travelling in the back, I found there was plenty of headroom in the central seat but it is comfier in the side seats. For the first year of Tulsi’s life when we would go out as a family, if I wasn’t driving, I would travel in the back with Tulsi, I know many other mums that do too, so it’s important to check the comfort of the back seats as you may be spending a lot of time in them! They were never something I gave any thought to before but I definitely notice a good or bad back seat now! I found I could wear a ponytail in both the front and back seats. The front headrests had a huge amount of adjustment which was fantastic! The cruise control is nice and easy to use, with controls are on the right of the steering wheel. I found it is not very accurate though, especially on undulating roads at 60km/h, where it just really got carried away up to 10km over the set speed! There are four air-con vents across the front dashboard. Two in the centre and one at either end. In the back of the central console box, there are two vents for the rear passengers too. There are no airflow or temperature adjustments, just the angle of vents but these are well positioned so you can reach and adjust them while driving. The airconditioning controls are really nice and compact, I really like how minimal they are and they are centrally located on the dashboard. The windows are tinted we have found them effective for reducing dazzling light on our daughter. The Commodore is a really long car and I found the visibility to be okay. I was testing the Tourer model which does sit a little bit higher than other variants, which might be why my visibility was good. I have used the reversing camera when maneuvering but actually, visibility isn't too difficult. For rear passengers the windows are big but they aren't terribly deep, which affects the view out for little passengers both forward- and rear-facing. There are lit vanity mirrors in both front visors, but the visors are not extendable. The interior lights in the back are in the ceiling, they are too far back in the ceiling to be reached from the front. There is a button in the front to turn all the lights off or on but not just the rear ones, unfortunately. Also if I am travelling home and it is getting near to bedtime and I DEFINITELY DON’T want her to fall asleep in the car as even a five-minute nap in the car means bedtime is all over!!!! I lean back and pop the light on so it’s not dark and try to keep her awake!! Along with screaming/singing at the top of my voice!!! The Commodore was really nice to drive, around town it was really enjoyable and didn't feel too big to nip about in. The only thing I noticed was when driving it first thing in the morning when the engine is still cold it makes some very strange noises and the engine revs for a really long time as if it stays in a too low gear. Parking is made easier with this big car with the reversing cameras and front sensors. Because it is such a long vehicle you do rely on them quite heavily. The sensors are front and back and the image comes up on the digital screen in front of the steering wheel and the reversing camera image comes up on the media screen. You can not mute the sensors but you can turn them off. The button to disable and enable the auto engine cut out and lane keep assist is down in the central console too. There is a handle above both rear doors to hang a baby toy but they are a bit too far forward for the toy to hang in the best spot. There is a 12V socket in the boot. The Commodore feels nice to be in, and aesthetically Holden have done a good job. It feels better quality than I was expecting and the interior and exterior design is great too. I am not too keen on the door and dash striped plastic but luckily it has not been used too heavily. It is a little like the fabric you would find your dad's pyjamas to be made from!! The Holden Commodore scored a five-star ANCAP safety rating in 2017, with an adult occupancy protection score of 93%, and rating of 35.5 out of 38 points. It scored 7.08 out of 8 for the frontal offset test, and 8/8 for both the side impact test and the pole test. The crash test performance for a six-year-old child scored 11.89 and the crash test performance for a 10-year-old scored 10.96. In the testing, in the frontal offset test, protection of the 10-year-old dummy was good apart from the neck, for which dummy readings of tension indicated marginal protection. For the six-year-old dummy, protection was good or adequate in this test. In the side impact test, protection of both dummies was good or adequate. For child safety features and child seat installation, the Commodore scored 7/13 for onboard safety features. It scored 12/12 for restraint installation and 14.99/16 for dynamic testing from the front and 7.97/8 for dynamic testing from the side. For pedestrian protection, the Commodore scored 78% (32.83 out of 42) and for safety assist it was scored 77% (9.35 out of 12). The Holden Commodore has a pretty long list of safety equipment as standard, with autonomous emergency braking (AEB), anti-lock braking system (ABS), automatic headlights, daytime running lights (DRL), anti-lock braking system (ABS), electronic data recorder (EDR), electronic stability control (ESC), emergency brake assist (EBA), emergency stop signal (ESS), forward collision warning (FCW), hill launch assist, lane departure warning (LDW), lane keep assist (LKA), roll stability system, trailer stability control. Some of these safety features are also features that drive me crazy as a mum! Like the lane departure and the parking sensor beeping sound. I want all the safety technology AND to be able to mute the sound when Tulsi’s asleep! 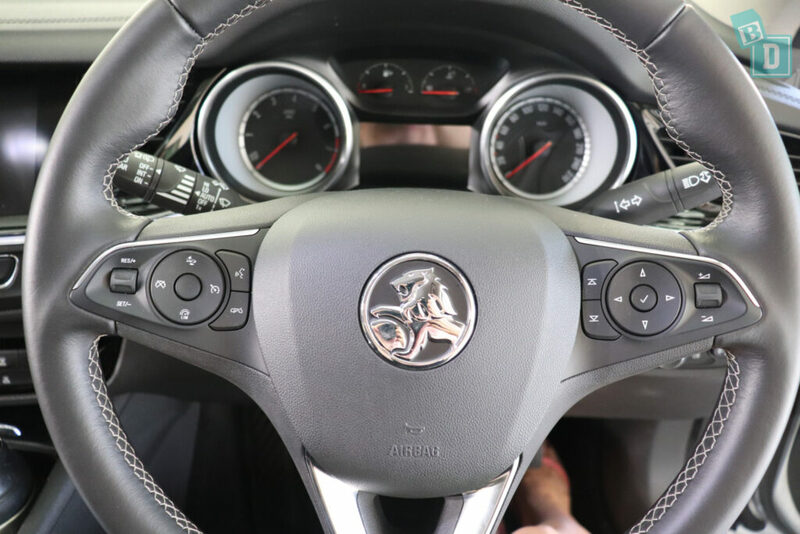 The Holden Commodore has six airbags as standard, dual frontal and side chest airbags in the front, and curtain head airbags for front and second-row passengers.